There are two ways to create an asset. The first way is via a purchase. The second way is by using a manual journal. We'll start by creating a new asset using a purchase which is the preferred way. Create a new purchase by selecting "Purchases" in the top menu and click "Create a new purchase"
Enter the details of the purchase document and select the appropriate general ledger account under the fixed assets category. In our example we're registering the purchase of a laptop and we choose office equipment as the general ledger account. When ready click "Save" and then "Approve" to make the purchase final. 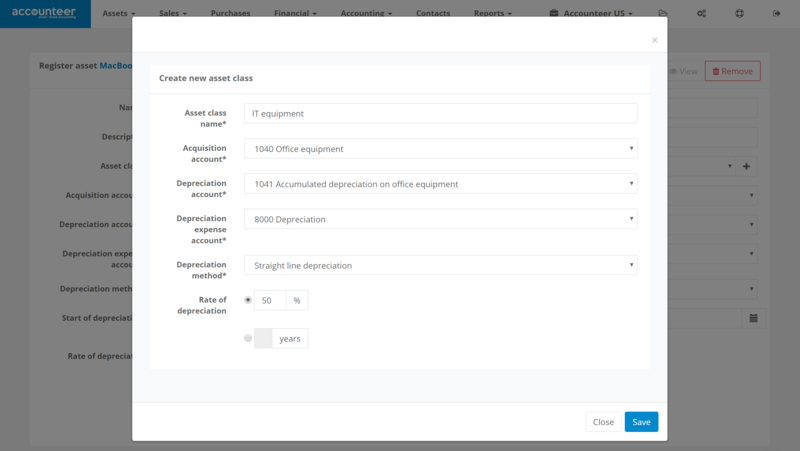 From the moment you approve a purchase linked to a fixed assets G/L account a new draft asset is created automatically. You can see this draft asset by going to "Assets" in the top menu and clicking on the "Assets" section. The next step is registering the draft asset. When registering an asset you define the method and the duration of depreciation. The first setting you need to define is the asset class. Every asset is linked to an asset class. Asset classes group similar assets together. Some examples of assets classes are IT equipment, vehicles or buildings. Usually all assets within the same asset class are depreciated the same way. Currently we haven't created any asset classes yet to chose from so we'll create a new asset class by clicking the plus icon. You'll need to define the G/L account where the acquisition value is posted on, the G/L account that holds the accumulated depreciation and the depreciation expense account. You'll also need to define the method and duration of depreciation. In our example we choose straight line depreciation over two years. Press save to create the new asset class. The register asset form will now take over all the settings of the asset class. You can override these settings for a specific asset but as a best practice you keep the same settings for all assets within a given asset class. Review all the settings and press register. The asset has now been registered. It's given an asset number and we can start depreciating the asset. To create a new asset via a manual journal go to "Accounting" => "Journal" in the top menu and then click on "Create new journal". 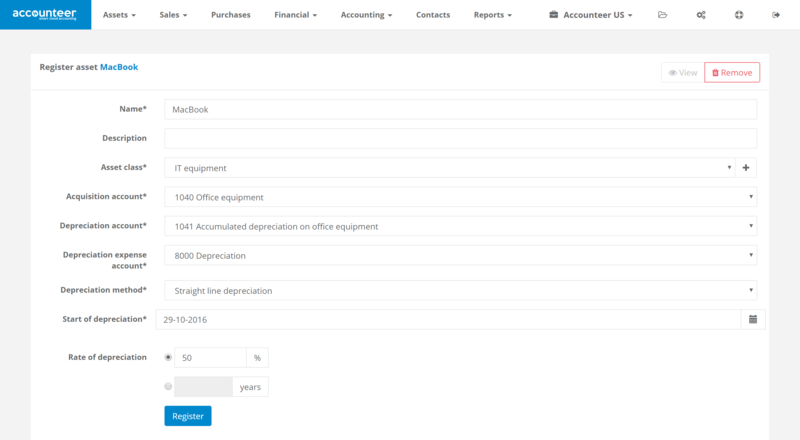 Fill in all the details and assign at least one line of your manual journal to a fixed assets account. When you finalize the journal by clicking the "Create journal" button a new draft asset is automatically created in the background. You can see this draft asset by going to "Assets" in the top menu and clicking on the "Assets" section. Follow the same steps a described above to finalize the registration of the asset.